Description: This text addresses the corporate causes of the collapse of the Qing Dynasty and the emergence of modern Republican China. Weaving together political, legal and business histories, it focuses on the key relationship between China, cement and corporations, and demonstrates how the particular circumstances of cement manufacturing in nineteenth- and early twentieth-century China serve to illuminate key aspects of Chinese political economy and illustrate the importance of legal frameworks in the emergence of industrial enterprises. 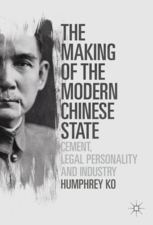 Examining the centrality of legal personality in China’s historical story, seen from the angle of cement manufacturing corporations, it offers an alternative historical perspective on the making of the modern Chinese States and delves into the involvement of larger-than-life historical figures of modern China such as Yuan Shikai, Chiang Kai-shek and the revolutionary and the father of modern China, Sun Yat-sen, in the unfolding of these events.